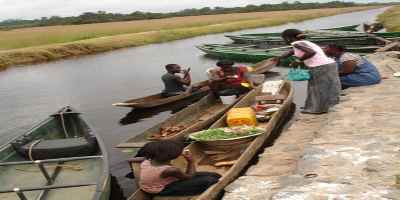 One of the natural attractions you don't want to miss when you happen to be in the Western Region of Ghana is the Nzulenzu village. This is the only Guest House on the water. of this town have a normal every day life just like people on dry land. Nzulenzu is located on the north side of the Beyin. Beyin is a transit town for tourists arriving from either Takoradi or Elubo(Ivory Coast border). It is a community of about 500 people living life to the fullest. 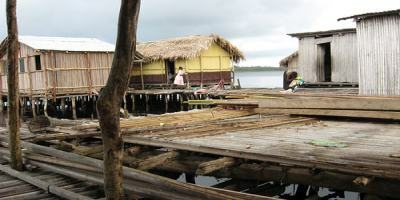 The entire village is built across a lagoon completely on stilts. The depth of this lagoon depends largely on the season and this can be between 4ft-8ft deep. You start your journey from Beyin by hiring a canoe which is very cheap and can be shared with other tourists or inhabitants if you're alone. Every canoe has a guide who paddles it and at the same time tell you stories about the origin of the village. 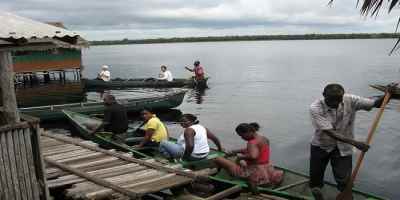 Its a jolly ride of about 20-30mins before you arrive at the Nzulenzu village. service runs between 8am-3pm daily, except Thursdays which is observed as a sacred day. The wetland around the village has the largest stand of intact swamp forest in Ghana. parrots and exotic birds and this is a nice place for bird lovers if bird watching is your hobby. You see, the whole idea about visiting this village is to see how people survive in different habitats, appreciate nature and be happy wherever you are. Its an eye opener attraction for every body visiting Ghana. So don't be left out.